Success story of the campaign that is proven to be best in the EMEA region in Google Premier Partner Awards competition. SMYK is an international chain of specialized shops with products for children. It offers everything that children need and dream about. The widest selection of top quality products for children aged 0-14 can be found in-store and online, at most attractive prices. The shops guarantee professional service and specialized assistants. Bluerank has cooperated with the SMYK brand for 5 years. 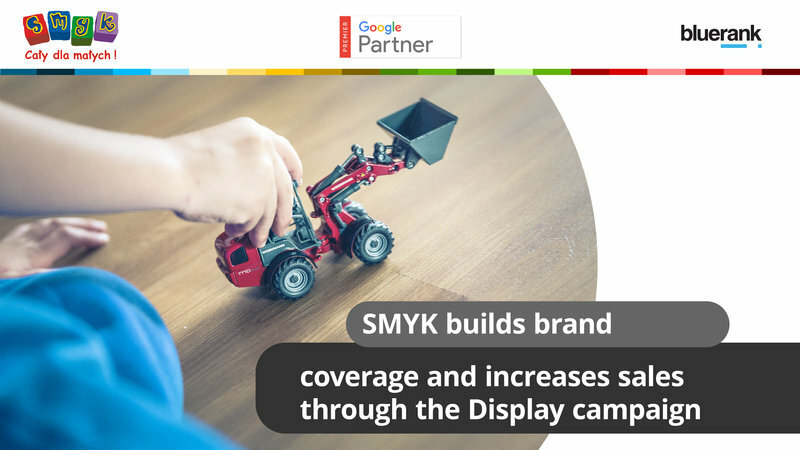 In the period of the described success story, the biggest challenge to the effective advertising campaign for smyk.com online store was launching the new version of the site and the increased activity of the competitors. Another element of the SEM action strategy implemented by us was the use of Google Display Network with particular focus on actions based on remarketing. See the success story of the campaign that has won in Google Premier Partner Awards 2016 in Display Performance Award category. See the success story of the campaign that has been awarded in Google Premier Partner Awards 2016 competition in Display Performance Award category.